In an era of streaming network-attached digital music sources you might think the time for listening to music as played from spinning silver discs is past, but that isn’t necessarily the case. In fact, if you have read between the lines of commentary from many of our reviewers you might have noticed a quiet trend; namely, a softly spoken preference for the sound quality of music played from discs as compared to the sound of the same music played from network-connected players or servers. It’s hard to say what accounts for this preference, but one explanation may be that top-shelf disc players are able to harvest audio data from discs with very few read errors (and thus minimal intrusion from error detection and correction algorithms) and can likewise present that data in as jitter-free a manner as possible. If that’s the case, then high-quality disc players may still enjoy a worthwhile performance edge vis-à-vis typical streaming solutions, meaning our prized disc collections might in turn have a new lease on life. This review focuses on PS Audio’s new DirectStream Memory Player, which is arguably one of the most flexible, capable, and forward-looking universal disc transports presently available. What is more, the versatility and performance potential of the DirectStream Memory Player are effectively multiplied when it is used in conjunction either with PS Audio’s award-winning DirectStream DAC or DirectStream Junior DAC, for reasons I will explain below. Naturally, the DirectStream Memory Player plays CDs, but it also happily handles many other disk types including HDCDs, SACDs, DVD-Audio discs, HRx discs, Blu-ray audio discs, and even user-created CD-R/RW, DVD±R/RW, DVD±R DL, and BD-R/RE discs. In addition to discs, the Memory Player can also play files directly from USB thumb drives via a convenient front panel-mounted USB port. To achieve this level of versatility, the DirectStream Memory Player is based on the time-tested Oppo universal disc player transport, but it is important to understand that it is not merely a re-badged or restyled Oppo. On the contrary, the Memory Player adds distinctive output features that distinguish it from the Oppo and most other transports on the market. On the rear panel of the DirectStream Memory Player users will find an AES/EBU and three sets each of coaxial S/PDIF and 12S digital outputs. The purpose of this somewhat unusual mix of outputs is to allow the DirectStream Memory Player to play multichannel surround/sound discs, with the three grouped sets of S/PDIF or 12S outputs supporting front right/left channels, rear left/right channels, and centre and subwoofer channels. Of course the DirectStream Memory Player can be configured for stereo-specific applications, which is likely how most audiophile enthusiasts will use it, but it’s nice to know the multichannel output option is there for those who need or want it. Perhaps more importantly, the DirectStream Memory Player is – unsurprisingly – a ‘memory’ player; rather than outputting data read directly from discs it instead outputs data from a very low-jitter buffer system that PS Audio calls a “Digital Lens”. However, the “Digital Lens” architecture used in the Direct Stream Memory Player is different to and better than the lens system found in the earlier Perfect Wave Transport. The old lens, says PS Audio, “relied on an intelligent RAM buffer to isolate digital data from the mechanical optical drive and laser mechanism” to output data “through a fixed low jitter clock to the DAC”. The new lens architecture “solves timing, noise, and isolation problems through a unique combination of buffer memory and FPGA-based digital processing” with the upshot that the new Memory Player “has been able to shorten the memory requirements and improve the timing of digital audio data”. In practical terms the DirectStream Memory Player moves from disc reading to ready-for-playback status faster than the original Perfect Wave Transport did and it sounds noticeably more sure-footed into the bargain. 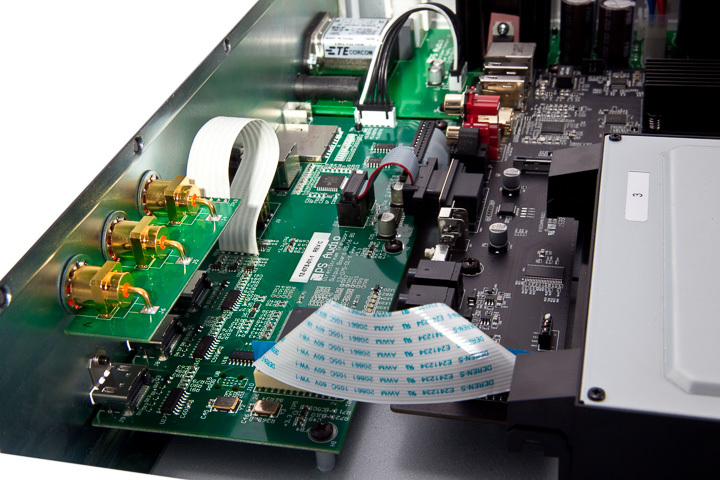 One major benefit of the DirectStream Memory Player is that it can output DSD data from SACDs directly through its 12S outputs, provided they are connected either to PS Audio’s DirectStream DAC or DirectStream Junior DAC (both DACs can accept DSD data through their 12S or USB inputs). No other player we know of offers this sort of DSD data transfer option, which is a boon for those who own (or might wish to own) large collections of SACDs.